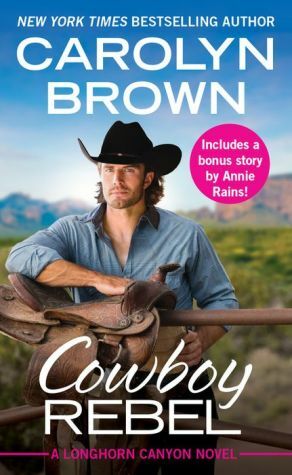 A wild Texas cowboy is about to meet his match in an ER nurse in this heartwarming romance from a USA Today bestseller, which includes a bonus novella from Annie Rains. Ever since losing his best friend in a motorcycle accident, Taggart Baker wants to make every moment count. No dare is too dangerous, no adventure too crazy for this cowboy. But after one bad brush with the law, he realizes it's time to ditch his hooligan friends and grow up. Now he's running his own ranch next to the Longhorn Canyon spread in Texas. Still, no one would ever call him tame. Nikki Grady has worked too hard for her RN license just to throw it away for some reckless cowboy who shows up in her emergency room after a barroom brawl. But she can't help being drawn to Tag's sense of humor and those crystal blue eyes. The more time they spend together, the more she sees his good heart. But just as Tag seems ready to settle down for good, his troubled past comes calling-and this time he won't be able to walk away so easily. Includes the bonus novella A Wedding on Lavender Hill by Annie Rains: When an event planner is asked to create the perfect wedding in just three days, she must turn to the last person she wants to ask for help -- the infuriating owner of the house on the hilltop.